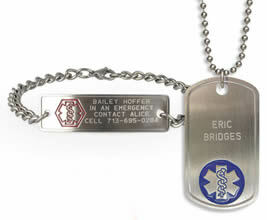 Get a FREE Engraved Medical ID. Simply complete their short order process to receive a FREE engraved medical ID personalized with your name and information. Once you have completed the full online ordering process, your order confirmation page will appear. Print your order confirmation for your records. One complimentary medical ID per addressee. Offer while supplies last. For the purposes of this offer, DO NOT add any additional items to your cart. You will know your order is complete once you arrive at the order confirmation page and receive an order number.